Annoying Passenger Anthem – End Armrest Wars! Savvy travelers hate elbow wars. Chatty Cathy, or dirty lavatories. They invite us all to “join the movement to make the skies a savvier” place. But what I found to be the best thing on the site, besides all of the information covering their design process, was this amusing little video. Enjoy! Who knows? They may just have the answer to armrest wars! 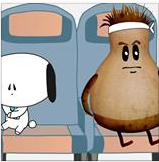 2 Comments on "Annoying Passenger Anthem – End Armrest Wars!" This past weekend it wasn’t just the armrest it was the hair flick and the boyfriends groping hands on her thighs. The woman sitting next to me continuously flicked back her hair not into my face but managed to get to the side of my head many times as she’d giggle while being pawed by her boyfriend. I was trying to take a little nap but it was pointless. They were more annoying than the infant in the next row over! Personal space is limited on flights in coach but being oblivious to the people around you for your own ‘personal enjoyment’ is just being selfish and rude. I was almost at the point where I could have taken my coat and use it to increase my mass in the hope it would prevent another unwanted hair beating. Sounds like an awful experience! I think you would have been spot on in using your coat as a buffer!